There is a certain time that is by far my absolute favorite moment in the day — the golden hour at dusk when the last rays of the sun color the treetops in shades of copper and gold… I was standing outside admiring it one evening (as I often do) when a light breeze ushered the most intoxicating aroma of lilac towards me and I couldn’t tear myself away. 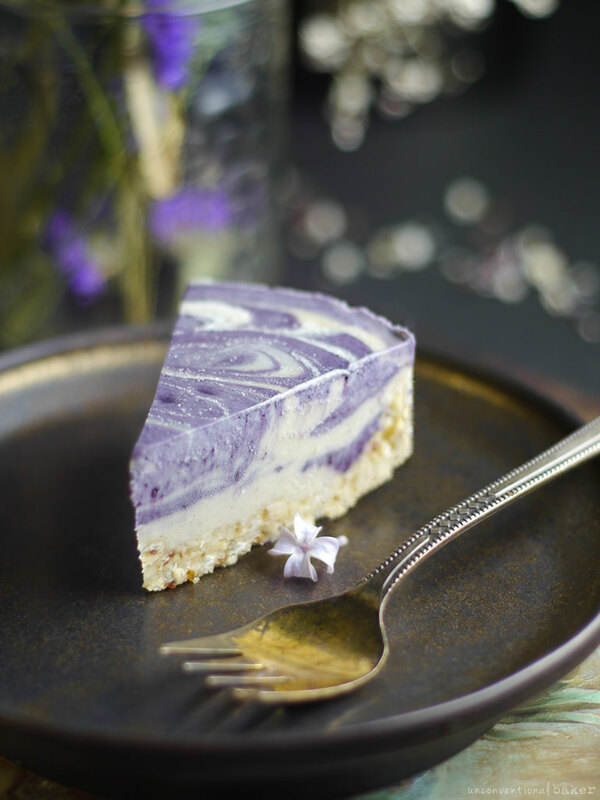 Then I wondered why I’ve never thought to make anything from that beautiful giant lilac bush in our yard… And so, as you probably know me a bit my now, I settled on making *something* and finally ended up with this delicious, raw, lilac dream cheesecake. But that one evening a certain curiosity was sparked. 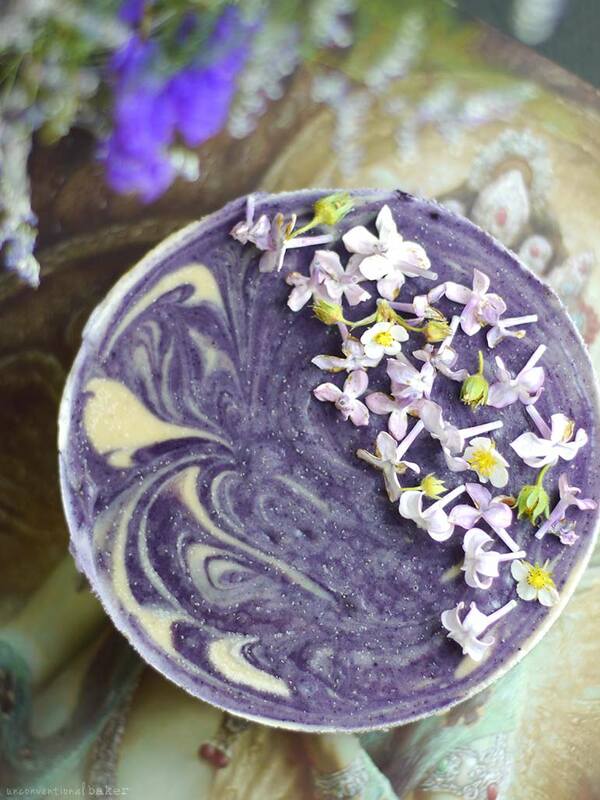 I asked some friends and blog readers on Instagram if they’ve ever used lilac in baking. Only one person had and they said they were experimenting with making a lilac syrup infusion. Apart from that no-one had given it any thought — I realized I was on my own. And when in doubt… you guys probably know my motto already… :) — I cheesecake *everything* — so I settled on doing just that. First of all, never use store-bought lilac (or other flowers) for culinary purposes (unless you know the source is organic or otherwise safe for human consumption). I’m talking flower shop flowers of course, not edible flowers sold in specialty shops. Flower shop flowers are grown with chemical fertilizers of all kinds and may therefore not be safe for human consumption. So only attempt something like this if you have a bush of your own, or if you find one in nature (P.S. for those in Ontario, I recall coming across tons of them while wandering around at the Mono Cliffs park a few years back). Another interesting thing is that while the flowers smell incredible, the flavor is quite uneventful — bitter-ish at best. After tasting it in a concentrated way I could see why there aren’t many people baking up a storm with lilac. You need a fair bit of it to notice the fragrance, but a fair dose of bitter substance and dessert don’t always get along, you see. The sugar-coated lilac, the only thing people do tend to make lots of, makes sense since the bitterness is well-masked then. Luckily I was able to balance the flavors enough in the cheesecake — no bitterness, and beautiful floral accent notes. Bingo. Raw cheesecakes for the win. 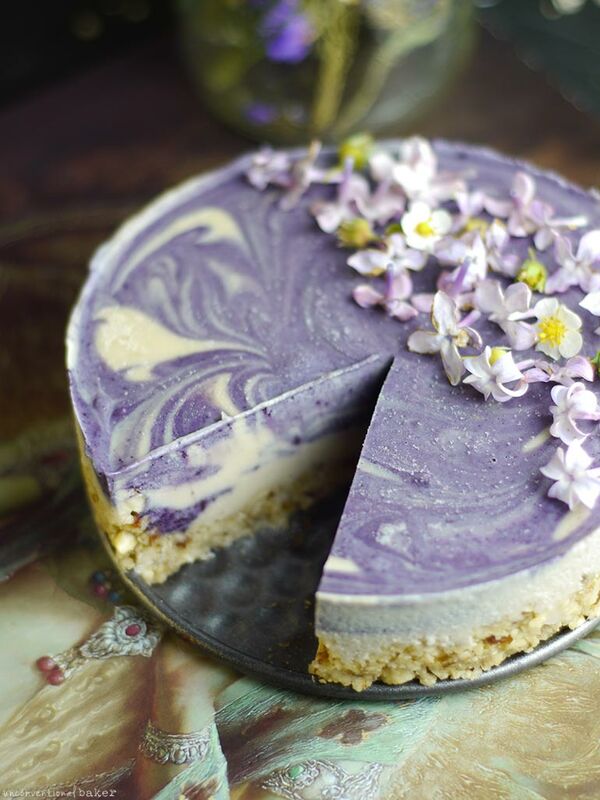 An interesting thing I discovered is that a whole cup of purple flowers, a purple cheesecake does not make! In fact, I suspected as much, and in my mind planned to combine it with something like a bit of maqui berry powder or blueberries to add a purple tinge. But still, I was a bit disappointed the purple didn’t come through at all, even at that quantity and in such a tiny cake — would have been nice. Perhaps if your lilac is a darker shade it would do something though (let me know if you try!). On the upside I just love maqui in anything and it paired beautifully with the lilac and happens to mimic its shades well, so no biggie in the end. Just an interesting observation about the coloring. 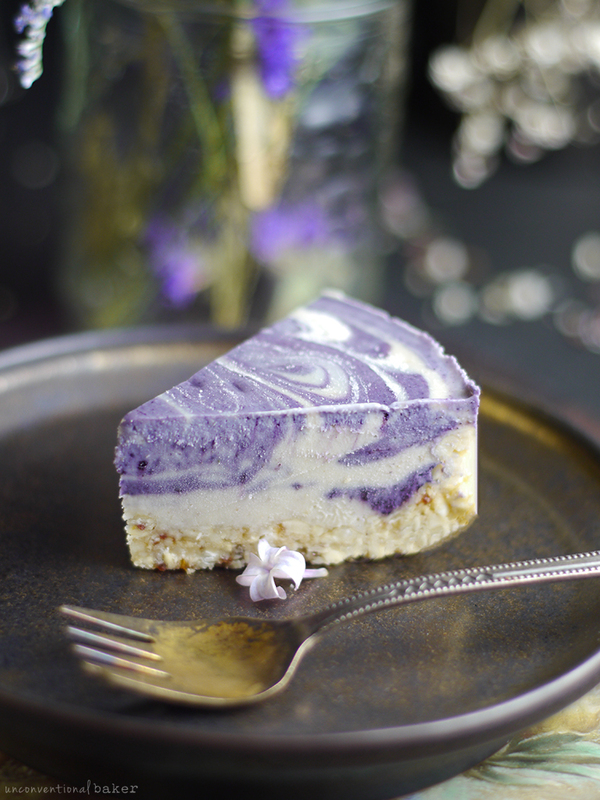 *Update on this note:* In the video for this recipe below by Janel, you can see that she used a slightly darker shade of lilac and it did seem to give the cake a light pink tinge, so that’s the result with using darker lilac in case anyone is curious. On a not so pleasant note… bugs! Beware. All those butterflies and bees buzzing around the lilac are pretty to watch, but the tiny creepy crawlies in the plant are less than appetizing. So to avoid any trouble, I snapped off 2 blossom branches and dunked them in a bowl of water (submerged) for some time to allow any resident squatters to vacate. Easy enough and did the trick. Alternatively you can just rinse the flowers really well. *Update on that last note:* one tip Janel, the videographer who made the lovely video for this recipe (see below), shared is that the the lilac water flavor appears to be stronger if you just let the lilac soak in water at room temperature for a few hours — she thought the steeping in hot water decreased the flavor. So there you go — something to try if you want the lilac water without the steeping. I was so impatient to try the cake out that I could hardly even wait 4-5 hours (as opposed to my usual overnight chilling time). I yanked it out of the freezer the moment it seemed good to go, took photos, and gave it a try. DELICIOUS, and such a beautiful flavor. I don’t know if anyone would be able to guess the main flavor — largely because it’s so unexpected — it’s subtle, but very present, floral and fragrant. 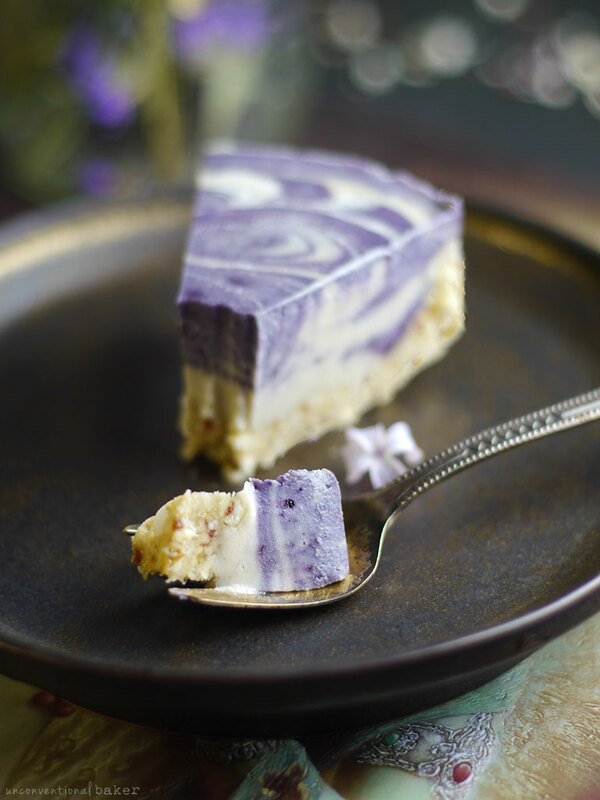 And the swirls in the cake combined with the beautiful fragrant taste and creamy texture just reminded me of something rather dreamy and swoony, hence dubbing it as a lilac dream cheesecake. I was so anxious about it in a strange way throughout the process that I wondered if I didn’t actually dream the cake up entirely — I even had to sneak away just now to have another tiny slice, just to make sure it’s real, ya know. And it is. Real, delicate, and gorgeous. 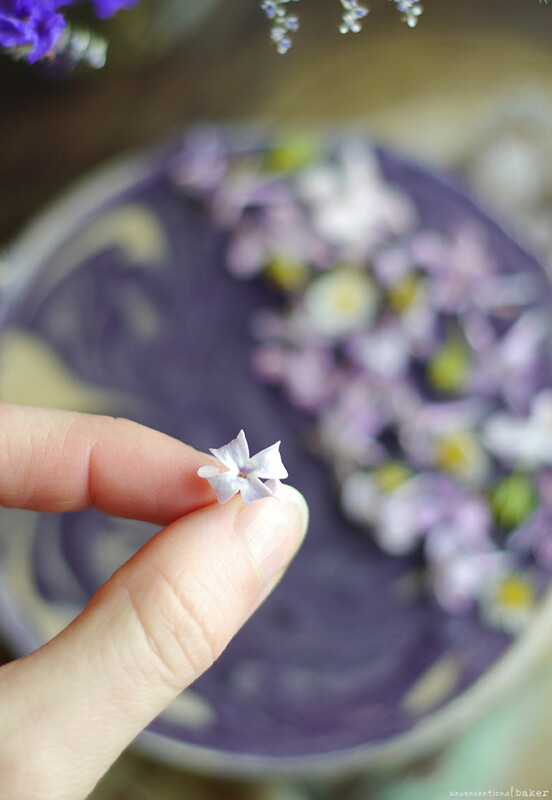 *Just a quick note on the video above: lilac flowers and wild strawberry blossoms (the flowers I used to decorate my cake) are edible flowers. In the video, the little white flowers used are not edible. Can still use them as decoration, but be sure to remove them before eating (as you would with other non-edible decorative flowers) — they are super pretty on the cake in the video. Alternatively, if you wanted to use edible white flowers but don’t have wild strawberry blossoms around, edible jasmine flowers are a great option too. 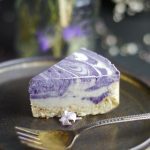 So if lilac is in season where you are, or if you’re looking for a unique celebration cake… or if you’re like me and will not relax until you know what a lilac cake tastes like, give it a go — I’d love to hear how you like it! Last but not least, a few more quick tips: 1. make sure all ingredients are at room temp before starting. 2. I used my 5″ springform pan for this. Triple for a 6″ cake, or make a few tiny cakes in silicone cupcake pans — and most importantly triple the cake if you’re making it in a large blender like the newer Vitamix Janel is using in the video above for the recipe to work. 3. If you need more tips on how to make raw cheesecakes like a pro, check out my book Unconventional Treats. 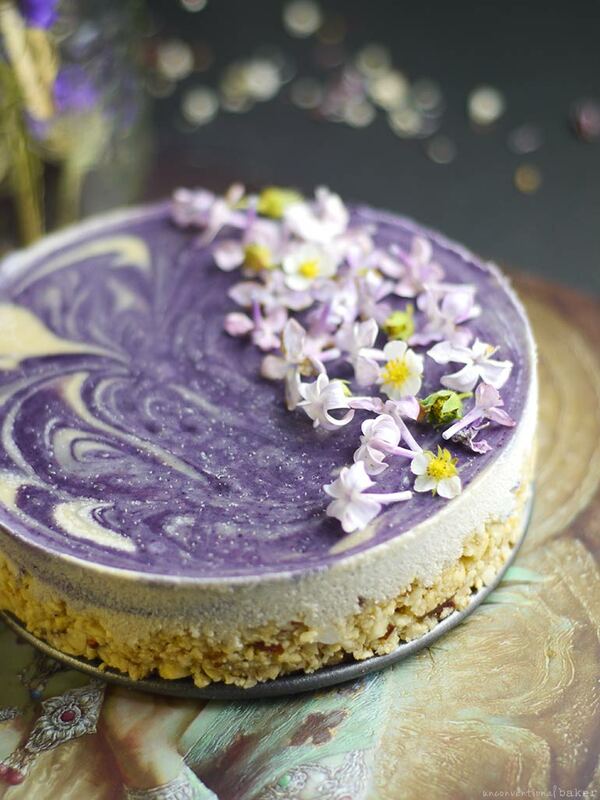 This lilac dessert is a delicate raw vegan cheesecake with beautiful floral accents and gorgeous purple maqui berry swirls. 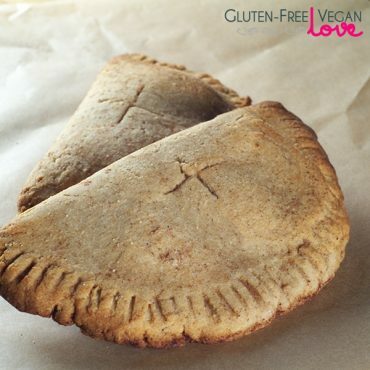 The recipe is also gluten-free and grain-free and refined sugar-free. Process all crust ingredients in a food processor into a sticky crumble. Transfer into a 5″ springform pan and press down into an even crust, lightly raising it around the edges just a bit. Place in the freezer while working on the next step. 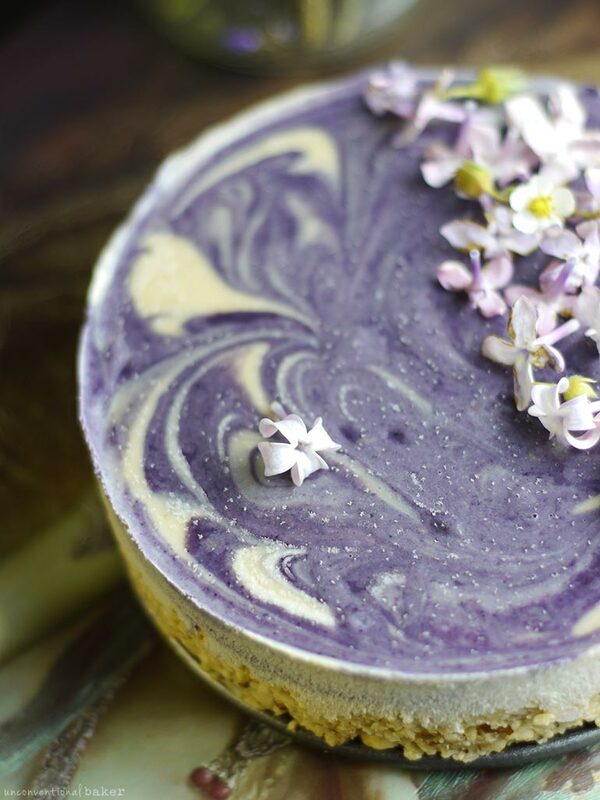 Blend all filling ingredients except for lilac flowers and maqui in a power blender into a smooth cheesecake consistency. Add the lilac flowers and blend them in. Remove and set aside about ⅔ of this mixture. Add the maqui powder to the ⅓ of the mixture remaining in the blender and blend until smooth. Spoon the mixtures into the springform pan over the crust, alternating between the purple and white mixture until you run out. Lightly swirl the two mixtures together with a spoon or a skewer. Freeze the cake for 4-5 hours or overnight to set. Decorate with fresh lilac flowers prior to serving and enjoy! Can thaw out for 15 mins or so for a softer texture or enjoy straight out of the freezer. **For the lilac water, combine an additional 1/2 a cup of lilac flowers with 3/4 cup water and let sit at room temperature for a few hours to infuse. Then strain off the flowers and use the water in the recipe. This step is optional, so can also use plant milk instead if you prefer. See notes above the recipe in the tips section for more details on the lilac water. Disclaimer: this post contains affiliate links to the maqui berry powder, coconut oil, raw cashews, medjool date, maple syrup, pure vanilla extract, salt, food processor, power blender, and 5″ and 6″ pans. dates wouldn’t work in a recipe like this as it would color the cake (I’m guessing you’ll get a grey/brown shade), alter the consistency and make it not as sturdy (since dates don’t freeze solid), and will alter the flavor as well. Fruit wouldn’t be sweet enough on it’s own (though there is a “fruit-sweetened” section on the recipes page, if you want to check out some recipes that are fruit-sweetened or date-sweetened only). I don’t know if date syrup works for you, but if it does you could try that. It would add a bit of a “malty” flavor and a slightly darker color but could still work. 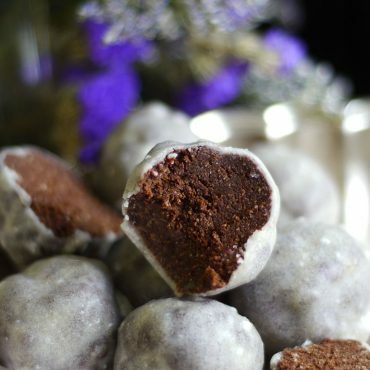 Other than that, I have readers who make these cakes with stevia and say it works for them. If you use any kind of sweetener substitute like that it will work fine, just be sure to add liquid to replace the liquid component that the maple syrup ads (i.e. if the recipe uses 3 tbsp maple syrup, then add 3 tbsp non-dairy milk + a pinch of stevia, etc.). So, I would like to make my own lilac water, but I was a little confused about what measurements you actually used in the end to make the water. You used how many cups of fresh lilac flowers to 3/4 cup of water? Hi Emily, for the lilac water part I used 1/2 a cup of flowers + 3/4 cup water (and boiled them together for 5 mins, and then strained the water for use in the recipe). I love the way this cake looks and sounds! But unfortunately I’m not near any fresh lilac. Would this recipe work with dried lilac or lavender? So sorry for the delayed reply. you can definitely use a much smaller amount of dried lilac or lavender instead (especially a smaller amount on the lavender — I would use maybe 1/2 a tsp dried lavender for this whole cake as it’s very potent, unless you’re someone who enjoys the strong flavor). You can also omit the flowers altogether and just have a delicious creamy cake — I make it without sometimes and it’s lovely on its own. That’s a beautiful idea, Joanna :) I love it. I don’t have lilac. Have you or anyone else made this replacing the lilac flowers with something else? Without the 1 cup of lilac, will it still turn out? Hi Jerri, yes absolutely. I made it without lilac and it works great on its own. You can add a little bit more vanilla to taste, but the cake is lovely on its own. It won’t affect the consistency much, so you don’t need to substitute with anything else. Enjoy it! It’s like reading a book. An extremely boring, self-indulgent “cheesecake thriller”. Otherwise, the recipe is good. Oh my gosh, you really cracked me up with the “cheesecake thriller bit” ? — does read like a novel in retrospect ?, though not sure about a “thriller”. Don’t know about the future of that genre though either way… ? Enjoy the recipe! Thanks so much, Anna! :) I really enjoyed making this one — glad it worked out well with the lilac. Absolutely gorgeous and dreamy! I just felt peaceful looking at the gorgeous lilac color. I can’t even imagine how delicious it must taste. I’m so glad to have found your blog!